Who's Winning The Super Bowl? Websense® scores a 2.0 Conversion! Ah, the Super Bowl---The estimated world wide audience is close to 1 billion people. CBS is commanding $2.6 million per 30 second high octane spot for the Super Bowl XLI Big Game tomorrow. To quote Joe Pesci, That's there business. That's what they do. Talent imitates but the real men of genius steal: It's always game time , for companies trying to piggyback or "backdoor" off the NFL's turf for free. 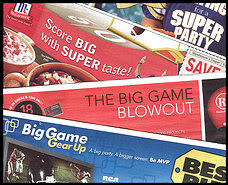 It's easy, and highly cost-effective, to suggest "Super Bowl" without saying it. The Washington Post calls this the Poor/Wise man's Super Bowl. Ed Reif calls it Sad-vertising. And then there's SeRiNdIpItY. When Generation Terrorist feel athletic, they don't go to a sports bar, they try hacking into sports websites. The Super Bowl is ranked as a Level 1 national security event, right behind presidential inaugurations. Here's a "Crying wolf" we can euthanize or at least put out to pasture. Those days of walking into a Home Depot and buying a box cutter are gone. Websense wins the Hotel @nyware-Picasso-Barbaro-Dunkin Donuts Award of Merit for heads up play in beating a dead (trojan) horse. As this weeks Good Cop; thwarting a virus-worm-malicious attack. Accepting on their behalf is their automatic computers who did the heroic act; an import-export game of reading data and connecting the dots. 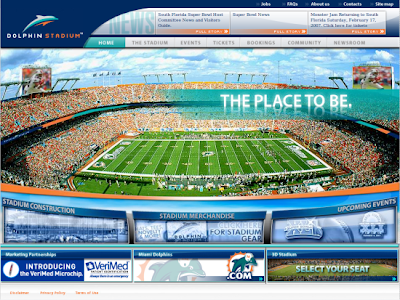 Offensive Hacking 10 Yard Penalty---Websense "discovered" that the official website of Dolphin Pro Player Stadium has been compromised with malicious code. Dolphin (Pro Player) Stadium site currently experiencing a large number of visitors, as it is the home of Sunday's Super Bowl XLI. The hack has been fixed----No Worries. Dan Hubbard VP of Security admits to Sportsline, "we literally find tens of thousands of these things a day-they are everywhere from big names sites like this one to mom and pop bakeries." He might as well "alerted" the millions of people who use free web based e mail, that they were going to get SPAM in their in-box. Isn't this nothing more than a keen sense for the obvious? Could the Geek Squad at Best Buy have figured this one out? I hope that bot (automated tools) Dan pays with bandwidth and electricity gets a little something extra in his CPU this month for moving the ball forward for Team Websense. Ed, Thanks so much! I really appreciate it, being on your blogroll. Find out how I'm "Using My Powers For Good"